B2B marketers often seem to lag behind B2C marketers in technological terms. Not all businesses opt for cutting-edge technology. Plus, their purchase cycles are decidedly more studied and less impulsive than the average consumer—but that doesn’t make what they do any less innovative. 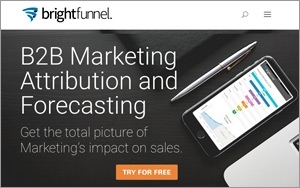 “Marketers struggle with connecting their revenue and marketing activities with results,” says BrightFunnel CEO Nadim Hossain. The San Francisco-based attribution and forecasting firm announced today a $6 million Series A investment round led by Crosslink Capital. The money will be used to develop and market their product and expand their team. There are many companies that collect massive quantities of data, but the point of Hossain’s company, he says, is to help B2B marketers make sense of all their data and enable them to ask more specific questions. Changing consumer habits have even affected businesses from the inside out. Digital touch points with products allow marketers to track more of the customer journey than was ever available to their predecessors. According to data from BrightFunnel, the sales cycle is lengthening. The average sales cycle for “high growth” technology companies in 2015 is 108 days while the overall lead-to-revenue cycle is 512 days, and from lead to close it took an average of 17.6 campaign touches for deals to close. Hossein says the success his company has had is an outgrowth of the system-wide trend towards data-driven marketing. Salesforce Ventures, Bloomberg Beta, Karlin Ventures, and Resolute Ventures all joined the round as well. David Silverman, a partner at Crosslink Capital, will join the BrightFunnel Board of Directors as a part of the deal.